When I made the decision to change centers (as chronicled in “Dialysis and the New Center“) it was both final and somewhat impulsive. I finally got pissed off enough that I was willing to make the dive. 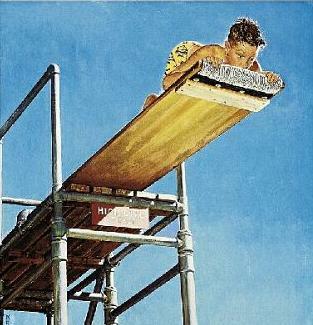 And the “diving” metaphor is appropriate because when I was five or six I loved swimming and I spent many days at the pool at Biggs Air Force Base near El Paso, Texas where in the summer it was either hot or hotter. Being underwater, for me, was the a place I could get relief from the heat. One day, my Dad was with us kids and I told him I wanted to dive off the diving board. He wasn’t surprised. I usually dove off the low board. I loved to dive almost as much as swimming underwater. The rule was, I had to be in the company of Dad or Mom. But this time, I impulsively decided to go off the high dive, a 30 foot tower! I don’t know why, I just wanted something different. I’d done the low board at least a dozen times and, to my young mind, it had lost it’s adventure. Dad didn’t stop me as I climbed the long ladder to the top. It wasn’t his nature to stop me from doing something. He was encouraging in all things but, I know he was apprehensive. As I reached the top of the ladder, I looked briefly at him from on high. He looked small. Everything looked small. The other end of the pool seemed a hundred miles away. I began to rethink my decision but when I looked behind me there were others coming up and I only had one way to go…. off the end of the board. I carefully made my way to the end. Seriously, I was worried I’d fall off the side. When they say a “dizzying height”, I know what they mean. Even though I had more than enough on either side of me to preclude that from happening, I was dizzy enough that I was scared of stepping too far to one side or the other. My toes grasped desperately at the sharp, sandy surface of the board. I carefully “walked the plank” and stood on the end. There was nothing in front of me but 30 feet of air and the water so far below, sparkling like a field of fiery diamonds in the intense Texas sun. Dad sat apprehensively on the side of the pool, watching. No matter what happened, I thought to myself, he’d rescue me. This moment, although difficult for me, was not easy for Dad either. He knew the power of water. He was once caught in the undertow in Long Beach, California and nearly drowned. Now, as he watched me, he was caught between the impulse to tell me to stop and his natural supportive, encouraging self. As I struggled with my instincts to reverse my intentions, he wrestled with his own mixed emotions. Although yards apart, we were in the same moment. I stood at the end and was faced with the decision whether to jump feet-first or dive. Seriously, I thought carefully about that. Feet-first would be safer but diving would be more fitting since it was a “diving” board. I figured I’d probably never do this again and I needed to be careful to make the right decision. I knew how to dive because I’d been doing it for a while but I still dove like a kid; raising my arms above my head, putting my hands together like I was going to pray (very fitting for that moment), bending over and falling head-first into the water. Hardly anything graceful but it’s how every small child does it. Only this small child was 30 feet in the air and was only 3 foot tall. It was ten times my height! The crack of my head hitting the surface of the water was my first experience with the properties of water. My only experience thus far with the hardness of water had been when I belly-flopped from the small distance of the side of a pool. That was a slap compared to this. I had an instant Physics lesson at age five that I would never forget. The faster you hit water, the harder it is. OW! It was like someone struck me with a hammer right on the top of my head. I didn’t have much time to recoil from the impact before I had to think about surviving under water. There were bubbles all around me and I flailed about. getting my bearings and trying to turn myself around to head toward the surface. But in that instant, I saw the bottom of the deep end. It looked a hundred feet down and was mystifying and enchanting. I looked up towards the sun and the surface seemed almost as far above. I knew how long I could hold my breath but I wasn’t sure how deep I was and if I’d be able to reach the surface before I ran out. Everything was a guessing game at this point and I didn’t want to take chances. I paddled desperately for the surface. When my head broke the surface, I immediately turned to find Dad and he was no longer sitting on the side of the pool. He was standing, ready to dive in after me but smiling because I apparently didn’t need to be rescued. I swam and dog-paddled towards him and he lifted me out of the water with one hand, patted me on the head and walked me quickly back to the shallow end. I think he’d had enough for one day, too. I still had a bit of a headache so I sat in a chair by the pool for a while and people kept looking at me like I’d done something impressive. I just took life as it comes and made the best of it; a style I still continue. Updated: 9/4/12: If you like this sort of tale from my wonderful, exotic past, I post these stories on my other blog “Legacy Tales“. This entry was posted in military brats, parenting, personal, Uncategorized and tagged achievement, devontexas, military brat, parenting, success. Bookmark the permalink. I loved this! It’s set up in the queue to send out to my other brat readers tomorrow, so hopefully you’ll notice a nice up-tick in traffic as a celebration for your beautiful writing.